For some of you dashi may be a new concept, you may have had it and not even realized it. For others who are steeped in Japanese food, you might know it well, but did you know how it was made? Basically dashi is like a stock or broth that forms the basis of many Japanese dishes like miso, simmered dishes and most dipping sauces. Dashi is regarded as the essential element that gives dishes that umami flavour that no Japanese dish is complete without. Umami is the 5th taste (outside of sweet, sour, salty and bitter) which balances the flavour of a dish and rounds it out. Tomatoes, fermented fish sauces, and of course dashi are classic examples of umami. Dashi is made by soaking kezurikatsuo and kombu (sea kelp) in warm water to make a broth. What is kezurikatsuo? 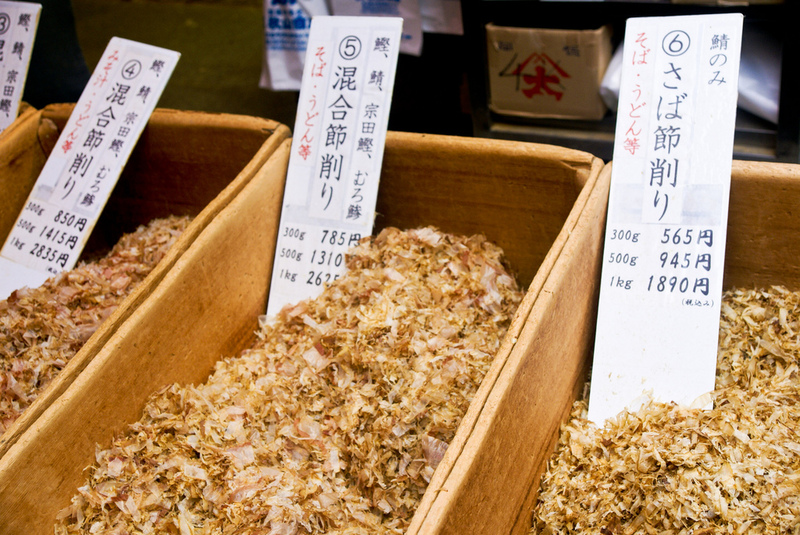 It is shavings from katsuobushi – which is a dried, preserved bonito fish (see photo above). This is classic dashi, but other kinds of dashi can be made with kombu alone or mushrooms which also carry the umami flavour. It’s easy to make, but best used fresh on the day it is made. when the flavour is most fresh and intense. Why not give it a try? It’s obviously perfect for homemade miso, but also great to try when making risotto at home. Step 3: Pull out the kombu and increase the heat to boiling. Let the kombu infused water boil for 5 minutes. Step 4: Add 2 cups of bonito flakes and reduce heat to low. Simmer and stir frequently for 10 minutes. Step 5: Drain the bonito flakes out using a fine mesh strainer or a coffee filter, so that you are just left with the broth. Voila! You have just made dashi! I think you’re kinda brilliant for breaking down the steps! We all crave that fifth flavor! I am wondering where I can get bonito flakes? Guess I’ll be shopping online.